Lindsay Arneson and Tanner Corwin always tell people that they were lucky in love, having found a soulmate in one another. 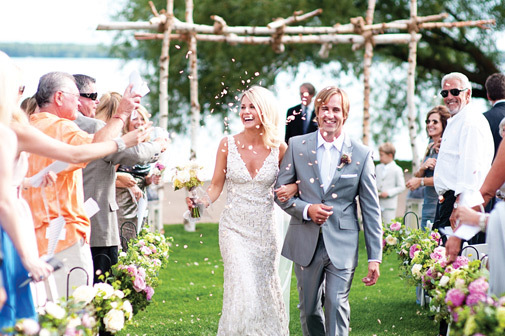 They add that they were very, very lucky that the often-fickle Minnesota weather gods smiled upon their lakeside wedding. Because the two love the great outdoors, woodsy elements were key components in their big day. Tanner handcrafted an arch out of birchwood under which the couple were wed. Lindsay filled dozens of hexagonal jars with sweet honey from her father’s farmland to pass out to guests. And together, the couple wrote the story of how they met, reading it aloud to their friends and family at the reception. Since Lindsay is a graphic designer, she created all the invitations and signage, and even crafted the flower balls that dangled on spaghetti-thin strings throughout the reception venue. Later, on the dance floor, the bride and groom surprised everyone with moves they’d choreographed themselves. As the night drew to a close, guests lit sparklers and waved farewell to the bride and groom, who left the lake feeling luckier than ever.